Director Jordan Peele won an academy award for his screen play in Get Out a Stepford Wives style film with racial overtones. Here he moves more toward the horror style in a story about a family that comes in contact with folks that look just like them who are determined to destroy the family and others in and around Santa Cruz California. To begin with we are introduced to the idea that many caves, abandoned mines and abandoned subway tunnels lie below the surface in America. It reminds us quickly of the old film Alligator from 1980 in which a little alligator that was flushed into the sewers grew large fast by feasting on rats that were filled with experimental chemicals. In ET we all remember Drew Barrymore repeating the line “Alligators in the Sewers.” Peele not only prepares us for the underground expected action, he shows each with a flock of gulls landing and taking over a section of the beach, could he have been thinking of The Birds ? 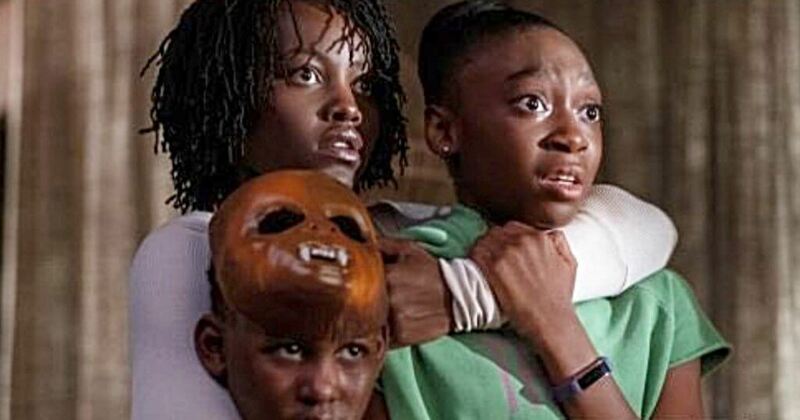 Shahadi Wright Joseph is effective as a teen who pays attention only to the small screen in her hand until she is forced into the battle late in the film. At times she comes through as does her little brother Jason (Evan Alex). Elizabeth Moss who has been a mean girl a number of times provides more comic relief as the battle rages, and she only has interest in the idea that she could have been a movie star if not for her two daughters. With mirror images from a Twilight Zone episode, challenges from many characters who wear red jump suits and carry large scissors, along with tee shirts that have meaning, Us is an exciting and bloody thriller that keeps us wondering what’s next as situations change quickly. The overnight fight to stay alive and battle the red suit underground dwellers is tense, interesting and sometimes bloody and it works, keeping us on the edge of our seats. A good script with some fine performing by the members of the Wilson family, (Lupita Nyongo’o, Winston Duke, Shahadi Wright Joseph and Evan Alex), Us is a worthy thriller even when it takes too much time to complete the chase near the end. This is not another Get Out but it is interesting and exciting film making. MPAA Rating: Rated R for violence/terror, and language.